Home > Computer > Internet > Software > Windows > Windows 8.1 > What is the Fastest Web Browser for Windows 10, 8 and 7? Mobile smartphones have taken over the world due to 3G and 4G internet connection capabilities. However, there are a lot of people who are still using their Windows powered computers and laptops to access the World Wide Web more briskly and perfectly. There are many best web browsers which you can use for surfing the internet and accessing your favourite websites . 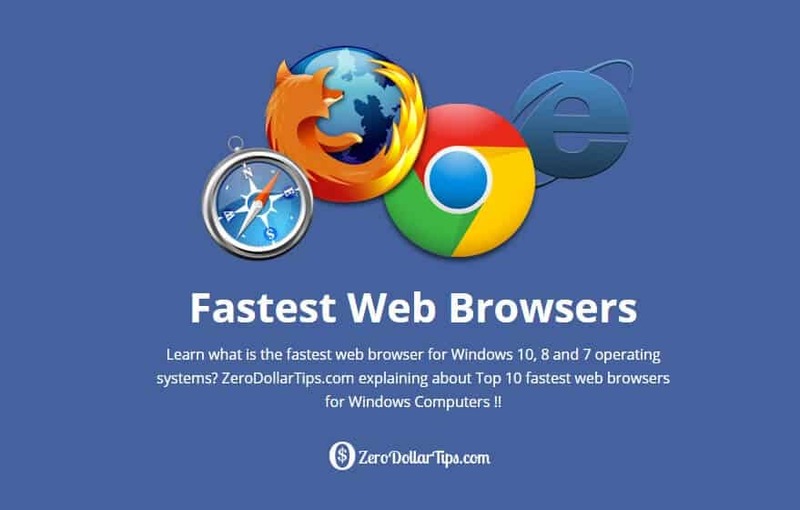 If you are wondering what is the fastest web browser for Windows computers then you are at the right place as today we are going to share the top 10 fastest web browsers for Windows 7, Windows 8 and Windows 10 operating system. What is the fastest internet browser for Windows computers? or, What is the fastest web browser for Windows 7, 8, and 10 operating system? etc are one of the most common and frequently asked questions of peoples. Undoubtedly, Google Chrome, Internet Explorer, Mozilla Firefox, and Opera are some most familiar internet browsers and people are using these web browsers from a very long time too. But if you are looking for a best web browser for Windows which have quality of faster startup, faster web browsing, fastest file download and video download, fastest photo upload, very less CPU usage, and many more flexible features etc then this guide going to help you a lot in selecting the fastest web browsers for your Windows computers. The first name which makes to our list of fastest web browser for Windows PC is Mozilla Firefox. Firefox was considered as one of the best web browsers some time ago but due to large memory consumption, people started looking for other alternatives. With new improvements and the latest version of Mozilla Firefox, you will be able to get best browsing experience by consuming low memory. According to me, Google Chrome is the fastest web browser for Windows 7 computers. This fastest web browser perfectly beats Mozilla Firefox in loading speed of HTML 5. The web browser is developed by Google and consumes very fewer resources. Opera is one of the best web browsers. As soon as you will enter the URL for opening a website in Opera, the browser will start compressing the web pages so that the website loads faster. This web browser for Windows computer works bit slow as compared to Google Chrome web browser but consumes very less memory which is really a quite important thing. If you are looking for fast, secure, easy-to-use browser then Opera browser is good choice for you. The web browser for Windows which consumes the least memory usage between Mozilla Firefox, Internet Explorer, Safari, Opera and Google Chrome is Safari. The web browser was developed for Mac but can also be used as the fastest web browser for Windows 8 too. The default web browser which comes with Windows operating system is Internet Explorer. There are a limited number of extensions and add-ons available with Internet explorer but the ones which are available make it to our list of fastest web browsers. If you will check the speed of this web browser you will get good results. However, the websites which have HTML 5 content on it might load a bit slow. Torch Web Browser comes with many unique features which you won’t find in other browsers. This is not only the fastest web browser for windows 10 but also a feature rich web browser. If you use social networking websites a lot then you will like this browser as it comes with share buttons using which you can share your favourite content on your social media websites with just a single click. The interface of this fast web browsers is quite user-friendly. Addition to all these things, media grabber, torch torrent, torch player, torch music, and torch games etc are some of the most useful attraction of this fast web browser. Maxthon Cloud Browser is available both for computers and mobile devices (Android, Mac, iPhone/iPad, Windows Phone and Linux). If you are using this fastest web browser for Windows 8 on your computer and mobile phone, your data will get synchronized automatically between both the devices. The web browser comes with the drag and drops feature which can be used for easy uploading of the attachments which you want to send to your friends and colleagues. Some of the features which Maxthon web browser comes with is parental control, mouse gestures & auto-fill. Maxthon Cloud Browser is also very protective in terms of security and privacy, so you shouldn’t worry about anything. Just download Maxthon Browser on your Windows computers and enjoy a very fast web browser. SeaMonkey is an open-source web browser which you can download for free for Windows operating system. Seamonkey is an all in one internet suite. This means you can use Seamonkey not only as a web browser but also as a chat client, e-mail client and WYSIWYG editor. If you are looking for a fastest web browser for Windows 10 with additional features SeaMonkey is the browser for you. Avant Browser is one of the few add-ons which are available for Internet Explorer. This browser comes with many good features like finding the on page functions, RSS feeds and tabbed browsing. Anant Browser won’t do well when compared with other web browsers but it is a good option for people who like to use Internet Explorer. Some of the best features of this ultra-fast web browser are: no ads and malwares, lowest memory usage web browser, video sniffer, internet download accelerator, split view, detached always on top browser window, offers private browsing, anti-freezing, fast and low CPU usage, no memory leak, web form auto-filler / startup login, online bookmarks, mouse gestures, ad/popup blocker, real full screen mode and alternative full desktop mode, flash animation filter, and multi-document interface etc. The last name which makes to our list of fastest web browsers for Windows is Deepnet Explorer. This web browser concentrates on the P2P networking along with RSS feeds. Along with these two, you get many additional features and tools too. So, these are the top 10 fastest web browser for Windows. We hope you now know very well – what is the fastest web browser for Windows 10, 8 and 7 operating systems after reading this post. Feel free to let us know using the comments section below – Which Internet browser you are using on your PC? And according to you, what is the fastest web browser for Windows 7, 8 and 10 operating systems? I use Polarity Browser for daily web browsing. I mainly use it for its low RAM usage and it is great for low end systems and older machines. Chrome and Firefox are just a bit too clunky now. Very important info provided by you, thanx! !